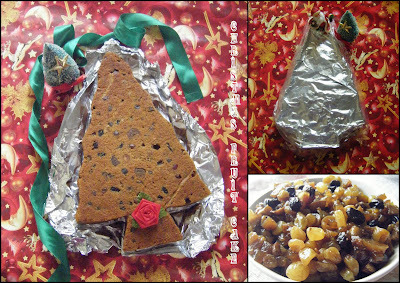 Easycooking: Christmas Fruit Cake ~ Merry Christmas!!! Christmas..the season of joy and happiness.Though we don’t celebrate Xmas,we are definitely a part of the festivities that come with it.Gifting of Cakes,sending Xmas greetings and special gifts for Chris-mom and Chris-child.Yup,the school I went to had this wonderful tradition of choosing a random friend from a chit out of a box which contained the names of all the students in the class.No one revealed who their Xmas friends were.Secret searches would begin as to what that person was interested in and what that person would like.The joy on someone’s face when you gift them something which they like is immense. Fruit cakes are synonymous with Xmas and no gift is complete without the signature Plum cake.As I have mentioned earlier,I made my first Christmas Fruit cake last year following Mishmash’s recipe.I loved the taste but wondered if I would take that extra trouble this year too when all around bakeries and hotels sell it like hot cakes[pun intended:)]. But as they say,there is something special when you make it on your own. I soaked the fruits and nuts about 3 weeks back and baked it yesterday so that by Xmas we’d get a matured-in-taste fruit cake.I got 2 cakes with the recipe and one is almost over.With a lovely golden caramel colour,just the right sweetness and the taste of fruits and nuts in each bite,this recipe is a keeper.I don’t think I’ll wait for Xmas to make this again. Soak the dry fruits, candied peel and tutti fruiti along with the cinnamon powder and cloves in 2/3 cup rum for anywhere between 24 hours and 1 year. (I soaked them for 3 weeks.) Do remember to remove the cloves before using the fruits. Grease and line two 8 inch baking tins and divide the batter between the two. (I used a Christmas tree shaped tin and an 8 inch square tin.) Bake at 190 C/375 F for about 50 minutes. One of the best tasting Fruit cakes,there are a few things which attracted me towards this recipe. --No fancy ingredients-eg:almond/rum essence,dry ginger,orange/lemon zest,spice powder etc--even without all this the cake tasted fantastic. --The ease of making it--just like any cake recipe.Mix-beat-bake. --No need to take special care while mixing in the fruits and nuts into the batter[no need to dust the fruits with flour].Even otherwise,the fruits gets distributed evenly and in each slice you'll get a bite of the fruits and nuts. --Addition of eggs as a whole--somehow,seperating the eggs and beating the egg whites till peak stage and folding it in scares me off a recipe!! I will be baking this cake again and again for sure.Try this out and you'll know why!! Christmas Fruit Cake is off to Divya of Dilse,for her event - Show me your Cake!! Priyanka of Asankhana for Its time to Jingle again.. 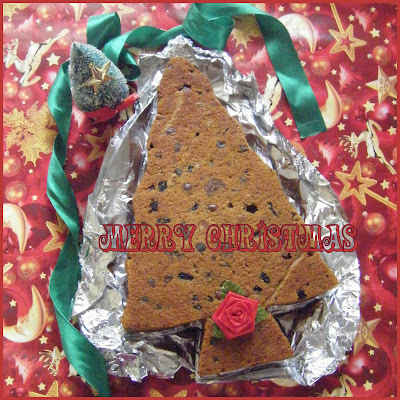 So we are 'X'mas tree-shaped baking tin' pals :) LOL! Loved the colour of your cake. I bet it tasted delicious! Looks Perfect Divya, can't wait to try this one out! This is a lovely recipe..i baked one a few days back and it turned out great!.. i have some more soaked tutti frutties and am looking forward to baking a cake just before cristmas..Merry christmas to you! wow..its looks great...i love christmas cakes ....but have never ventured to make my own...love this one esp its shape! Looks perfect & yum. Loved the cake shape. 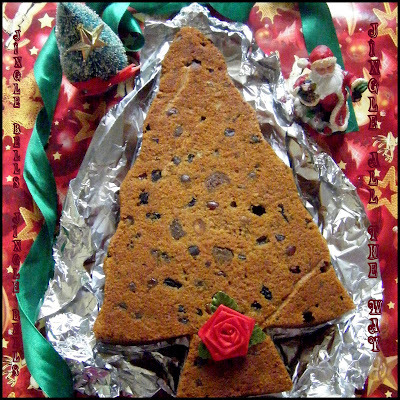 That is a lovely Xmas tree shape cake! Perfect for the holidays! Did u soak the fruit, nuts etc in rum and leave it outside or refrigerated? Fabulous cake and perfect with so many fruits and dry fruits. happy x'mas. Looks delicious, I like the way its presented...merry xmas! That's an awesome cake, Merry Christmas to u. Pretty looking cake Divya. Am baking the same recipe from Raaga tomo. Keeping my fingers crossed. You could send this to Show Me Your Cake event being hosted in my blog if you wish. The cake looks lovely ! 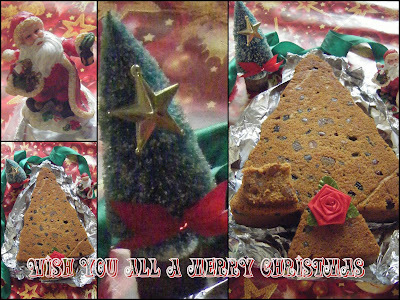 Merry Christmas to you and absolutely luv that christmas fruit cake..
Looks delicous Divya. Wishing you and your family Happy Holidays and a new year ahead! Lovely cake, Divya. I made it today..though didn't soak the dried fruits for weeks, soaked it in OJ for 24 hours and used amaretto instead of rum. Tasted real good.. last year made it from Cham's recipe and this year this one.. thanks muchos, dear! Your cake looks amazing. I liked the creative way of Christmas tree shaped cake, quite creative. I will make Fruit cake sometime soon. Hmm... yummy i loved the recipe and the method of baking. and i will surely try this weekend at my end. and surely give you the feedback. I hope my son likes it as he is very found of cakes and that too fruit cakes. just wanted 2 ask u,wats the measement of 1 cup u use?128gm or 236gm? Hi Divya,the cake came out very well.i have just removed it out of the oven.the whole house is smelling of the cake and I am feeling soooo happy.Thankyou so much and God Bless.